According to Ayurveda, the first requirement for healing oneself and others is a clear understanding of the three doshas. The concept of Vata-Pitta-Kapha is unique to Ayurveda and it holds the potential for revolutionizing the healing systems. Individual constitution is acquired at birth and remains constant through life. Through Ayurvedic books, teachers, and courses, one is able to determine one's individual constitution and thereby knowing which direction to take for self-diagnosis purposes. A balance among the tridosha is necessary for health. For example, the air principle kindles the bodily fire, but water is necessary to control fire, otherwise the bodily fire would burn the tissues. Vata moves Kapha and Pitta, since Kapha and Pitta are immobile. Together, the tridosha governs all metabolic activities; anabolism (Kapha), catabolism (Vata), and metabolism (Pitta). When Vata is out of balance, the metabolism will be disturbed, resulting in excess catabolism, which is the breakdown or deterioration process in the body. When anabolism is greater than catabolism, there is an increased rate of growth and repair of the organs and tissues. Excess Pitta disturbs metabolism, excess Kapha increases the rate of anabolism and excess Vata creates emaciation (catabolism). Here comes the role of Kerala Ayurvedic Centre at Care Well Medi Hub. We help you balance these doshas & cure the body using natural herbs & oil, without any side effects. 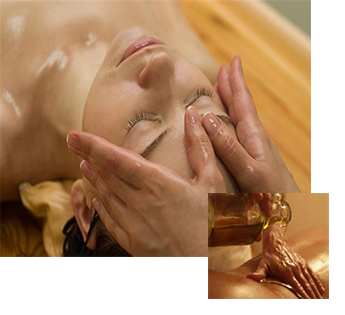 This relaxing and refreshing full body massage is a masterpiece of Kerala Ayurveda. It is done with medicated herbal oils by two therapists in a synchronized manner for 45 minutes. The number of strokes and pressure vary with the condition of the individual. This massage is indicated daily to prevent ageing and degeneration. This seven-position therapy will treat the whole body physically, mentally and emotionally while balancing the doshas. Its rhythmic motion helps to relieve joints and muscles from stiffness and helps in freeing body movements. This stimulating treatment increases blood circulation, which in turn encourages quick removal of metabolic wastes, while providing relief to diseases such as anxiety, fatigue, circulatory disorders, arthritic problems, backaches and injuries. The effects of both are compounded since the heat and steam allow the medicated oils to seep into the body and nourish from the inside.